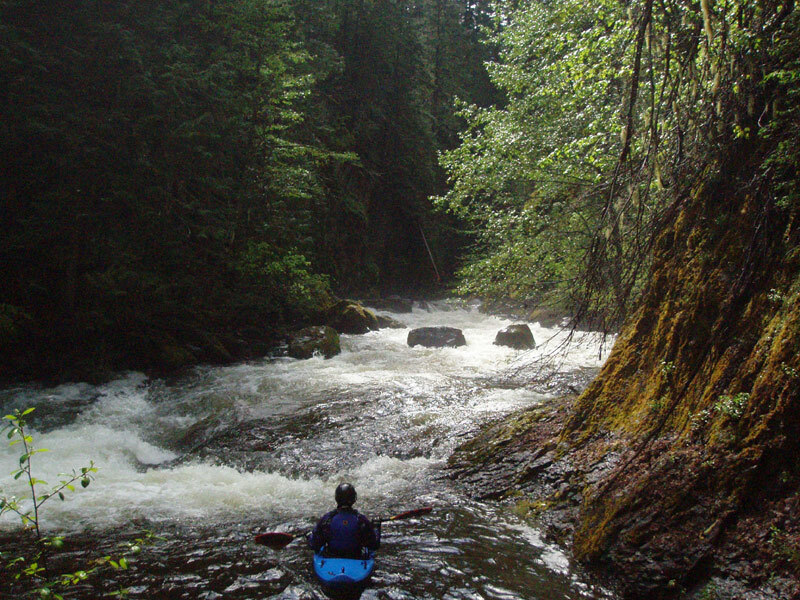 An account of the first known descent of Cultus Creek into Upper Trout Lake Creek, 6/4/2006. Nature: Steep boulder gardens, ledges, falls. 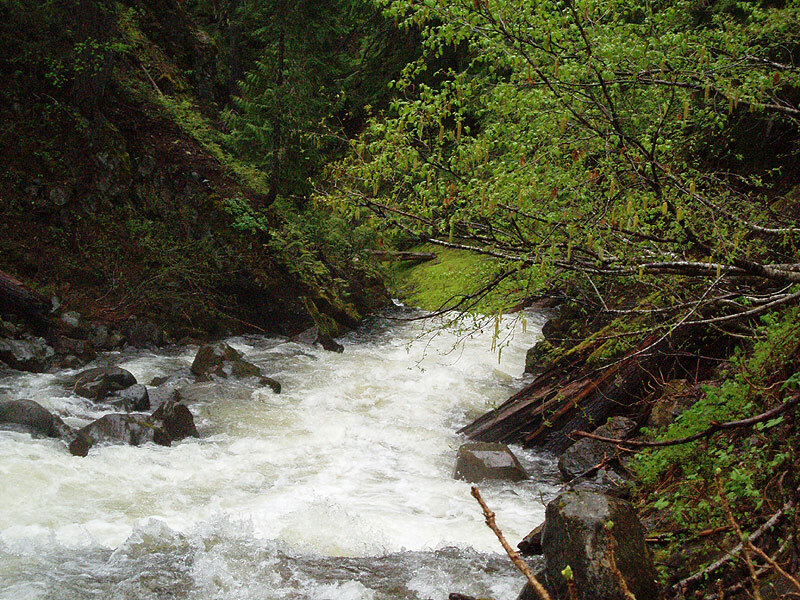 Trout Lake Creek is the largest tributary of the much-storied White Salmon River in Washington. 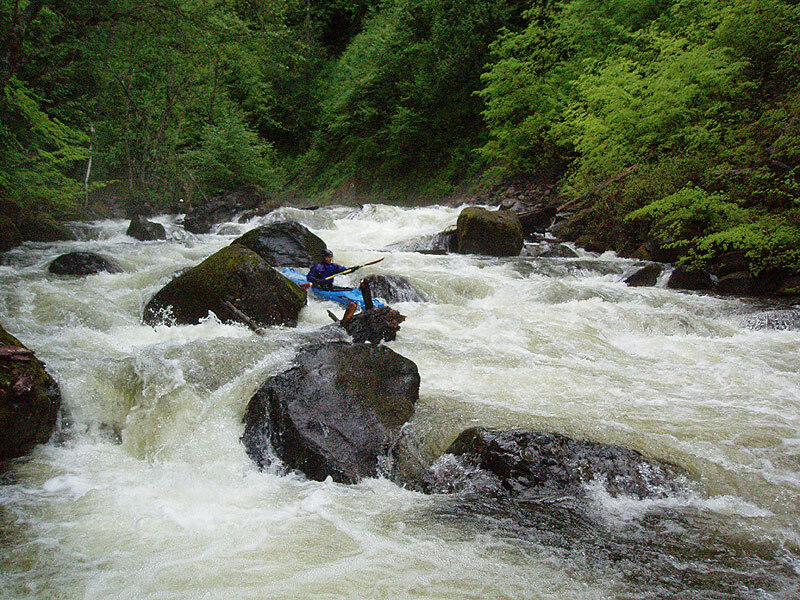 The White Salmon is one of the nation's whitewater icons, with five runnable sections that flow year-round, ranging from class II to V.
Given the quality of the lower sections of the river, it seemed logical to us that the upper tributaries might have something interesting to offer. Our interest was finally translated into action by Chad Belville, a local kayaker who sent us photos of one of the steep creeks cascading down into Upper Trout Lake ( this was Kenobi Gorge, which we ran later ). We were expecting an epic runoff in the Columbia Gorge because we were sitting on a huge snowpack, so we knew that in early June we would have plenty of water. The only challenge we faced at this point was actually getting into Upper Trout Lake Creek, which has no road access whatsoever. On this particular trip I was joined by Jon Fowlkes, Pete Giordano, and Tom Cwiklinski. After consulting my rather frayed Washington Gazetteer, it appeared that our access options into Upper Trout Lake were limited to several short, steep tributaries. This was confirmed on the drive in, when we tried several roads on the map, none of which got us acceptably close to the uppermost reaches of the creek. 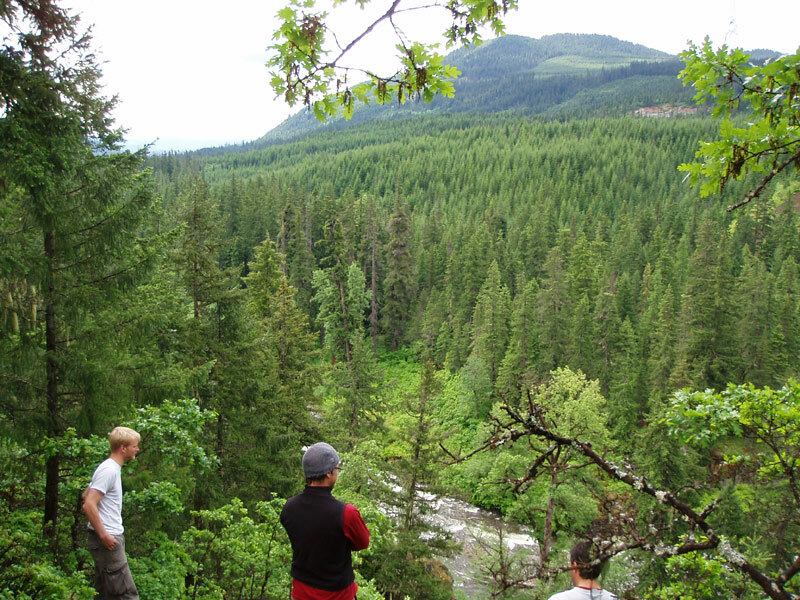 Jon Fowlkes, Tom Cwiklinski, and Pete Giordano check out the lower stretch of Trout Lake Creek. This was taken on one of our fruitless attempts to access the uppermost reaches of the creek via road. After trying the roads on the creek-left side of Upper Trout without success, we tried the main road on creek-right. This led us to the first of three steep creeks that plummet off the ridge down into Upper Trout Lake Creek. 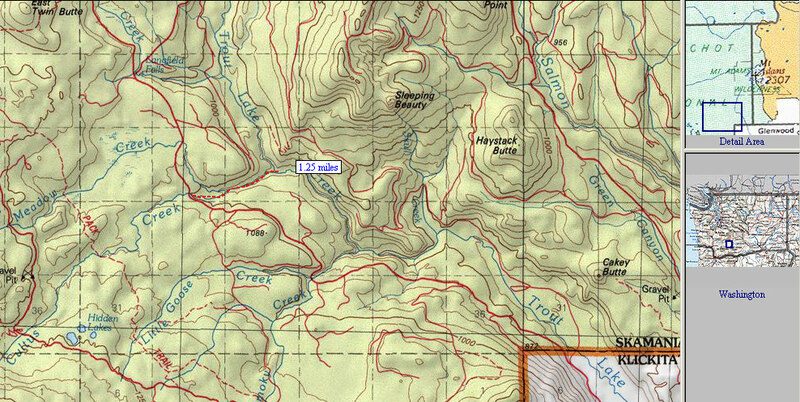 The first trib we came to was what would later become known as Kenobi Gorge, a 640 fpm steep creek that was running way too high to even consider. We hiked the upper part of Kenobi, gaping at the churning, smoking towers of bowel-loosening whitewater below us, and decided that an exploratory descent was not an option on this particular day. However, what we saw there later led to the first known descent of Kenobi a few weeks later. We put on and were immediately dodging logs. 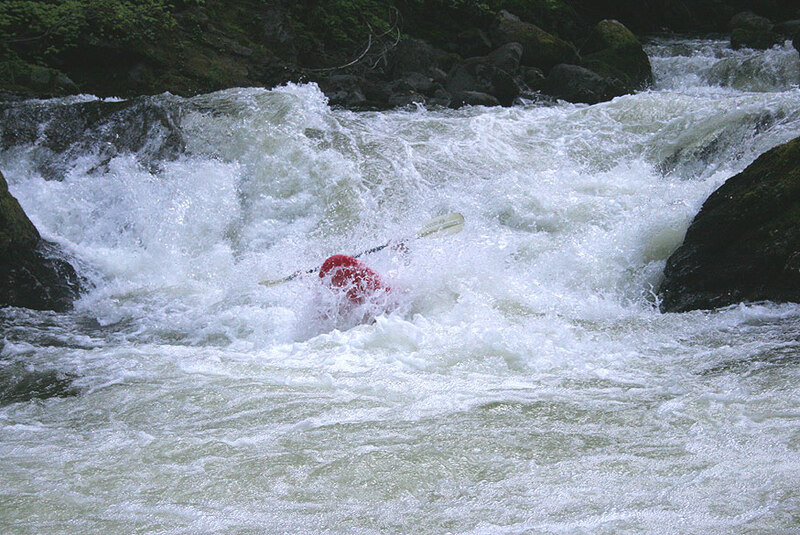 The first move out of the eddy involved a mad scramble the creek-left side to avoid getting tucked under a big one. We made the best of it though, and there were some pretty good drops in there in between loggy bits. 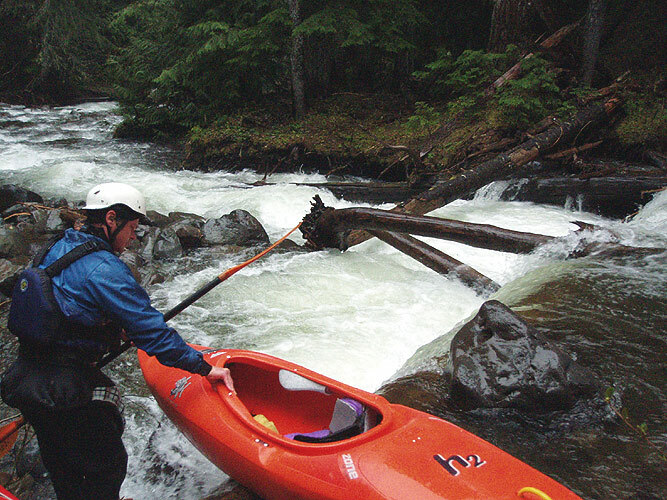 Tom works his way past the first log portage on Cultus Creek. One of the impressive things about Cultus is the forest. This creek is bordered by a spectacular swath of old-growth cedars and pines, and we should consider ourselves fortunate that this whole section flows through the Skamania National Forest. We definitely took the time to enjoy the scenery on the two or three short portages on this creek. Tom runs a fun drop. Finally after about a half mile we started to see bedrock, and my waterfall radar started going off. Sure enough, we ran a little ledge and then the creek dropped off the face of the earth, thundering over a forty foot falls just downstream. The falls looked very clean, but the landing zone was of questionable depth. I think that a scouting trip in the summer at low water should determine the runnability of this one, and then we will have yet another huge drop in the Columbia gorge to test the nerve of the region's waterfall warriors..
Tom scouts Cultus falls at the confluence of Cultus and Meadow creeks. Nobody ran this falls but it looked very clean; the only question was pool depth. We portaged Cultus Falls on the creek-left side, dropping down a sliver of land between Meadow and Cultus Creeks ( Meadow Creek joins Cultus about a hundred yards below Cultus falls ). 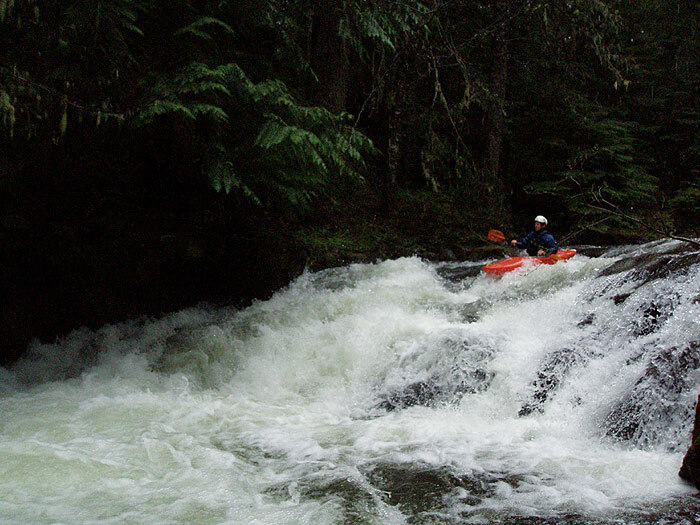 Jon looks upstream at Cultus Falls during the portage. The confluence Cultus and Meadow Creeks is visible just downstream. Just downstream of Cultus Falls we arrived at an intimidating gorge. All we could see is that the creek tore down a long rapid then disappeared between vertical walls. The hectic, eddyless lead-in to the gorge fragmented our team. Jon had somehow managed to stop on the left hand side by tackling a boulder ( there were no eddies over there at this flow ) and was scouting. The rest of us stopped at various points upstream and hiked down the right side as far as we could. It was impossible to approach the gorge on the right, so we were limited to peering downstream from the right wall. Once we could see into the gorge, we immediately started considering portage options. The entrance rapid drops over a corkscrewing cascade into a log on the right and a piton rock on the left between vertical walls. Below this first drop the enters a fast-moving pool that ends abruptly at a deadly, unrunnable, log-choked boulder sieve. The entrance drop looked marginally runnable, but any mistake would put you into the sieve just downstream. The horrible-looking entrance cascade is just out of sight between the vertical walls downstream. The portage looked hard and time-consuming, so Tom and I started to climb up the wall on the right, while Jon checked the portage line on the left side. After an arduous climb up the right wall using a rope, Tom and I climbed back down to help Pete and Jon portage. Just as I reached the anchor station ( a large tree ) I saw Jon getting into his boat. As I stared in disbelief, Jon went tearing by below us and disappeared into the gorge. Shortly after that Pete followed him. I was really worried, because I couldn't see how they could run the entrance drop, and there weren't any eddies above it that I could see. Tom and I climbed downstream as fast as we could along the wall, and soon we were in a position to view the entrance rapid from below. Once we were in position, we could see that there was an invisible, small eddy under the creek-right wall, just big enough for one boat. Apparently Jon had been able to see this eddy from the left wall, and decided to give it a go. As we watched, Pete came down and skidded to a stop just above the horrible entrance drop, and both Jon and Pete portaged at creek level. Decision time. There was no way down to Pete and Jon from our vantage point, it was easily eighty feet of vertical rock walls down to the creek. So, we had two options: The hard, slow one, which was to reverse our portage, or the fast, easy one, which was to continue downstream and drop into the gorge below the next portage. 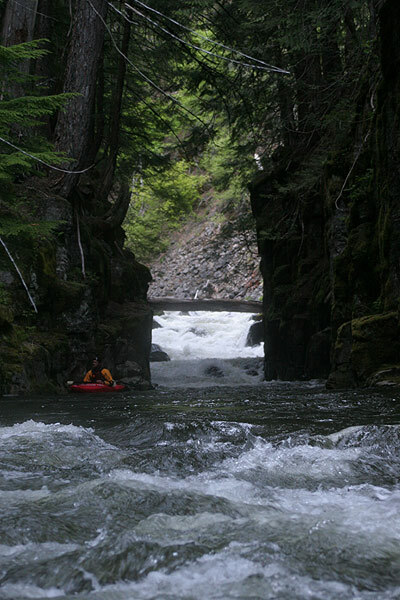 We chose the fast, easy one, which was to continue downstream and drop into the gorge around the corner. This proved to be a big mistake, because there ended up being no way back down into the gorge. After hiking for about a hundred yards, Tom and I stopped and discussed going back upstream and putting in above the gorge. In the end we decided not to because it would take a lot of time and we were worried about becoming separated from Pete and Jon. There was also no way to communicate with them because the walls were now overhanging and the creek wasn't visible below. So, with much frustration, we ended up hiking all the way down past the confluence of Trout Lake Creek before we could get back down to creek level. Pete and Jon later said that the half-mile gorge was fun, with lots of bedrock slides and clean drops all the way down to the confluence with Trout Lake Creek. After a brief delay we regrouped on Trout Lake Creek, which was running bank-full and felt like a large river after Cultus. Upper Trout Lake definitely exceeded our expectations. As we worked our way downstream we encountered some big, fun boulder gardens ( similar to the Upper Wind ) and other drops of similar quality. There were no wood portages. 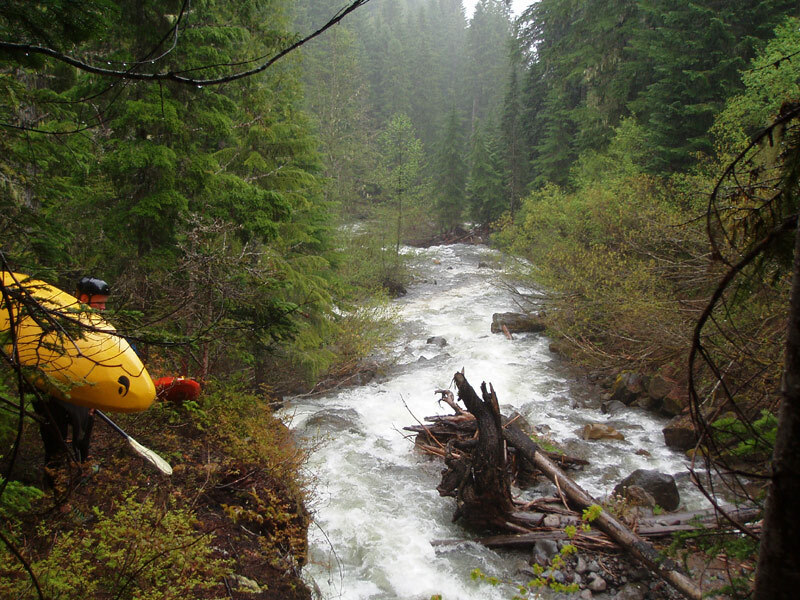 Pete looks upstream at a typical rapid on Upper Trout Lake Creek. Looking downstream at a typical boulder garden on Upper Trout Lake Creek. Pete runs a boulder garden on Upper Trout Lake Creek. Soon the creek narrowed down and we arrived at what appeared to be rapids leading up to an even more impressive gorge than the one we had encountered on Cultus. Everyone but Jon got out to scout on the right side. Pete got down to the entrance drops first and started giving signals to Jon, who peeled out and fired off the whole sequence without scouting any of it first. When we arrived at the entrance ledge I dubbed it 'See no Evil' because the hole was munching and we were impressed that Jon had cleaned up on it without scouting! Jon Fowlkes tests the hole in 'See No Evil'. Jon, in the See No Evil Gorge.. The large class V boulder garden below the entry ledge is visible upstream. The gorge itself is very short and contains no rapids except for the entrance drop. The gorge turned out to be very short, and then just downstream Little Goose Creek ( aka Kenobi ) came in on the right hand side, increasing the flow yet again and leading to a fun, bouncy ride down to the take out bridge. It is worth noting that there was only one log portage on the lower section of Upper Trout Lake Creek below the confluence of Kenobi. It was really surprising how little wood there was on both Cultus and Upper Trout Lake. We definitely had some log portages, but I only remember two or three easy walk-arounds. There were no logjams at all, which is pretty surprising. The forests around these creeks ( especially Cultus ) appear to be untouched by man, and so the old-growth makes it easy to move around ( this probably also relates to the relative lack of wood in the creeks ). 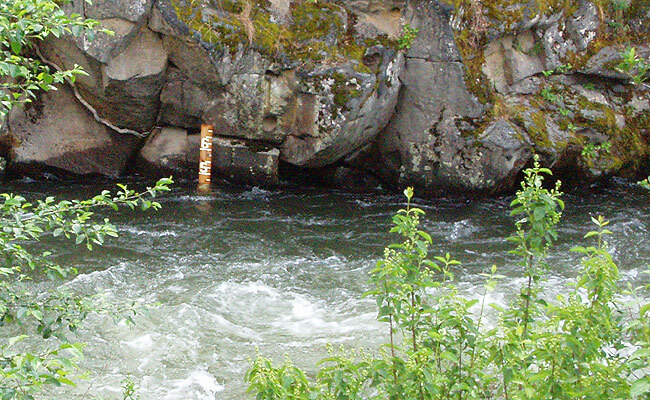 For flows, you want at least 4 feet on the White Salmon stick gauge below Husom Falls. We had between 4.5 and 4.75 in June from snowmelt as pictured below. Peak of snowmelt as soon as the road opens up is generally good. This one is also a good option if you get to nearby Kenobi and it is too high. The stick gauge below Husum Falls on the White Salmon, pictured on the day we ran Cultus. The water was surging between 4.5 and 4.75 feet. ( Note: On the following weekend, Jon Fowlkes and Mike Long explored Mosquito Creek, the third and final steep creek that drops into the upper reaches of Trout Lake Creek. 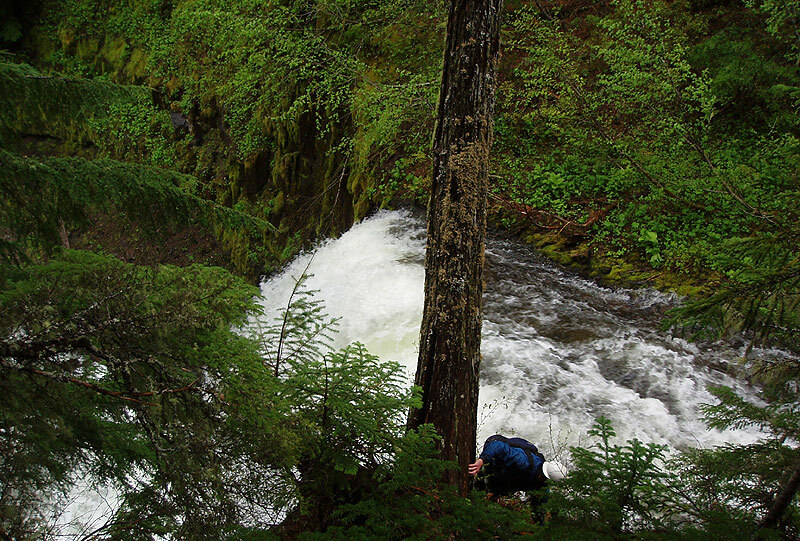 They reported a huge, unrunnable falls, lots of wood and mank on Mosquito, and some fun stuff on the section of Trout Lake Creek between the confluence of Mosquito and Cultus ). A map showing the section of Cultus we ran. The next creek downstream is Kenobi Gorge, and the take-out on Upper Trout Lake is visible where the road crosses the bridge several miles downstream. 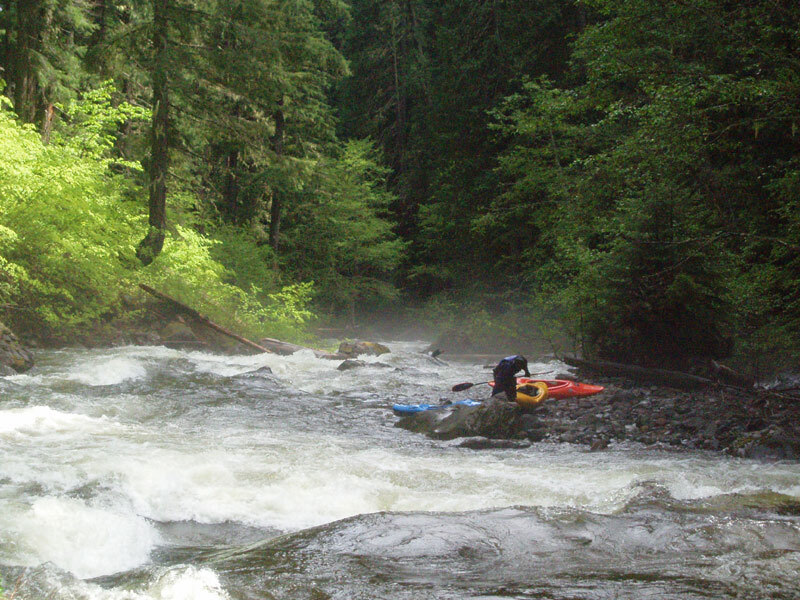 All of the good whitewater on Upper Trout Lake is above the confluence of Little Goose Creek ( aka Kenobi Gorge ).